Notice : Activation key must be used on a valid Steam account. Requires internet connection to install.The game activation will NOT work from these territories: Japan, Taiwan, Hong Kong, North/South Korea, China. 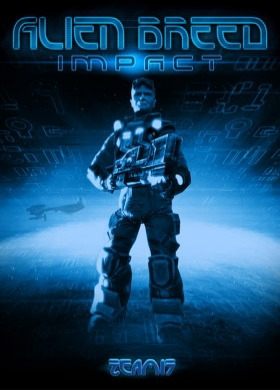 ABOUT THE GAMEAlien Breed Impact is an explosive science fiction arcade-shooter that resurrects a much revered franchise with an epic story, swarms of highly intelligent alien enemies, h… igh-impact weapons, highly detailed and rich environments; all implemented with superb technology in a state-of-the-art gaming experience. In addition to the thrilling single-player campaign mode, the game also offers a relentless, action-packed, online two-player co-operative battle mode. Alien Breed is back! – An action-packed mix of arcade-shooter, survival-horror and tactical weapons upgrades and customisation. Epic single-player story mode - The single-player campaign mode that follows the narrative of the game through five huge and challenging environments. Single-player free-play mode - A single-player challenge mode – beat your high score on a previously completed campaign mission. Two-player co-operative play mode – Work together to defeat the alien horde across three specifically customised maps. Additional Steam online features - Quick Match, Create Game, Friends Lists, Voice Chat, Leader-boards and Co-operative Achievements. FREE TRIAL – The “Prologue” sample section – a specifically designed introduction to the game; play in either single-player or two-player online co-operative mode. NEW – Upgrades shop– Search fallen comrades and lockers to accumulate cash, and then tactically spend it on weapons/kit upgrades in the shop. NEW - Enemies– Re-imagined and improved Alien Breed enemies. SYSTEM REQUIREMENTS Minimum : Operating system:	Windows XP SP2 or later Processor: 2.0+ GHZ Single Core Processor Memory: 1GB RAM Hard disk space: 1.5GB Video: NVIDIA 6800+ or ATI Radeon X700+ Video Card Sound:	Windows Supported Sound Card DirectX®:	9.0c Controller support? Yes Any special multiplayer requirements? Internet connection required. Alien Breed™: Impact Developed and Published by Team17 Software © 2010 Team17 Software and Alien Breed: Impact are Trademarks or Registered trademarks of Team17 Software limited. All rights reserved. All other trademarks, copyrights and logos are property of their respective owners.